You can be photographed in front of a blue or green chromakey backdrop and then be placed in any photo. Now you can have a photo of yourself anywhere in the world. The photo at left was taken with a Main and a Fill light using a Chroma Key Green backdrop. 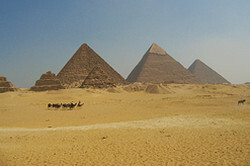 This photo was combined with the photo at the right to make the photo below. The Background at left was combined with the photo taken with the Chroma Key Green backdrop to make the photo at right. 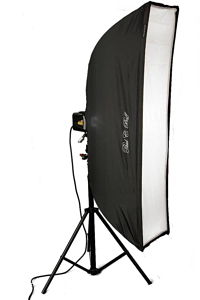 The photo at left is of a very large umbrella mounted on a light stand with a 1320 watt second studio light. The umbrella has a white difuser and produces a high quality soft light. Also, the larger the umbrella the better the light quality (softer shadows). The orange line across the center of the umbrella is a yard stick to show the size of the umbrella. This umbrella can be used as the main light. 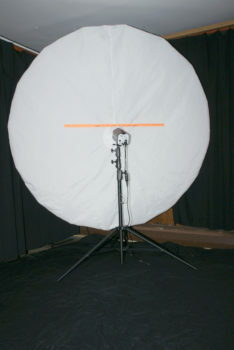 It is 86 inches as measured tip to tip across the top arc of the open umbrella and produces a wide beam of light for great looking photos. Another 64 inch umbrella can used as the fill light. Various other gold, silver or white umbrellas are available as needed. 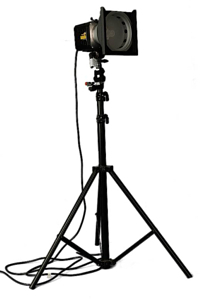 Several softboxes of various sizes can also be used when needed. 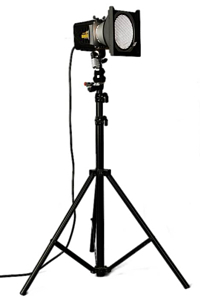 The lighting is supplied by studio flash units. The studio lights can be equipped with umbrellas, softboxes, grids and colored gels as needed. Portraits taken at the studio use a black and/or green backdrop (background). Most portraits use the black backdrop. 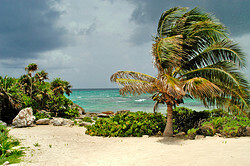 The green backdrop is used to substitute (using software) other photos as the backgound.